Our Wednesday VCL match was at Quesada, against the Tigers and all in all it was a close match, with both teams taking 3 rinks and the Tigers taking the overall shots by a small margin. A good away result for El Rancho. Ladies singles: Carolyn Harris 21-9. Gents singles: David Whitworth 6-21. Pairs: Jane Hamill and Stew Hamill 21-16. Triples: June Whitworth, John Skipper and Jim Gracie 21-9. Rinks: Pam Harris, Barry Bright, Brian Taylor and Shirley Edwards 12-16. Rinks: Bob Easthope, Brian Harris, Jan Bright and Richard Lee 8-23. Result of the games played in the Men’s 4 x wood pairs on Monday 12th June. 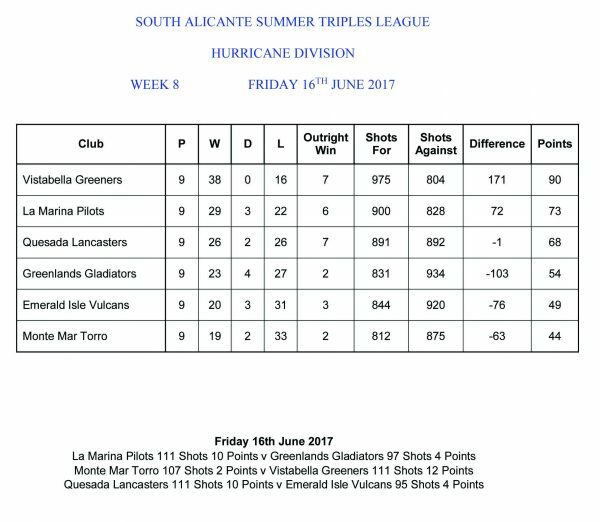 Greenlands versus San Miguel, Home – shots for – 23 against 11. Away shots for – 12. Against – 18. Points for – 3 against – 2. 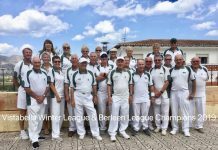 In The VCL match played away at Monte mar the weather proved to be a big a challenge as the games but after a very friendly game Greenlands came away with a very respectable score winning on three rinks and drawing on one. Final score was – 9 points to 5. In the Hurricane Division the Gladiators were away to La Marina Pilots. Final score was – Total shots for – 97. Against – 111. Points for – 4. Points against – 10. There were two drawn rinks and one winning rink won by Jean Thompson, Jean Giddings and skip Dave Webb. 20 shots to 15. 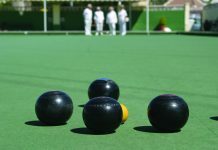 Greenlands Bowls Club are looking to add to their current membership and would welcome new members and ensure they would have regular games in all leagues. 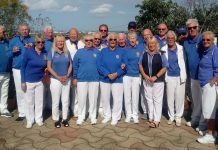 We pride ourselves on having one of the friendliest and sociable clubs on the Costa, so why not find out for yourselves and give Haley a ring on 966844399. Last Saturday Jack and Barbara Cooper invited other La Siesta Members to join them in a Fun Competition to celebrate their Golden Wedding. A Large turnout in glorious weather saw all rinks being used whilst others turned up just to join in the celebrations. The competition consisted of three separate 6 end disciplines consisting of normal ends, fixed jack full length and fixed jack minimum length. The winners Norman Adcroft, Irene Laverick and Dennis Andrew received their prizes from Jack and Barbara. Lollipops were handed out for every member that a bowl touching the jack. Needless to say the 50 lollipops on offer did not last long. On behalf of the club members our President Jean Cooper presented Jack and Barbara with cut glasses and a bottle of Bubbly. In the VCL league La Siesta visited San Miguel Deputies and gained 6 points to their opponents 8. 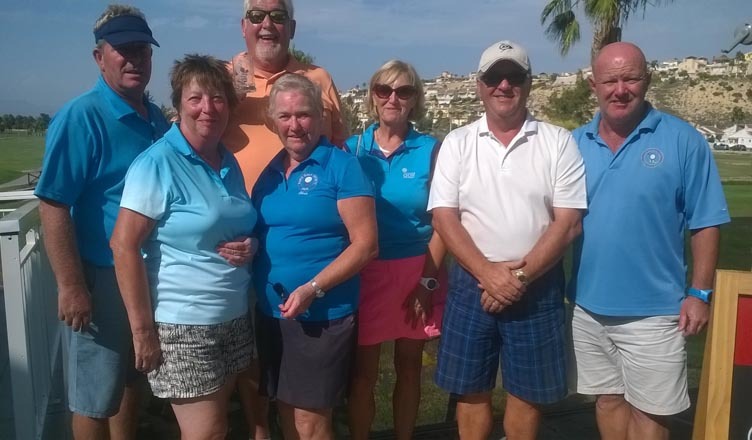 The overall shots going to San Miguel by 103 to 94.Winners for La Siesta were the Pair of Dawn Taylor and Mike Edwards by 18 shots to 16.Whilst the Rinks teams of Joy Gardiner, Pat Moore, Brian Gardiner and Jean Cooper won 18-12 and the rink of Tanya Oliver, Tony Campbell, Bill Jordan and John Ball won 20-13. In the Spitfire Division the Wasps entertained Quesada and managed to win on 2 rinks picking up 4 points with Ramsey Sinclair, Pat Moore and John Ball winning by 22-20 whilst Dave Davies, George Richardson and Mike Edwards who were one shot behind after 16 ends managing to pick up 6 shots without reply on the final 2 ends to win 20-15.The overall match shots were 116 to 91 in favour of Quesada. In the Harrier Division the Hornets got back to winning ways with a 8-6 victory away at San Luis Hercules. The overall match shots going to the Hornets by 113 to 103. The winning rinks for the Hornets came from Hilary Clarke, Trish Reilly and Vic Mahomet by 27-13,Tanya Oliver, Tony Campbell and Pat Reilly by 22-11 and Ron Sheldon, Sue Mahomet and Rab Logan 20-14. Another hard fought match against Greenlands, winning on two rinks and drawing on one. 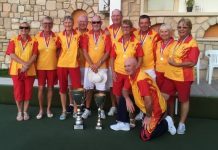 Well done to Alan Ashberry (singles) Wendy Sheridan, June Young, Joe Ridley and skip Dianne Ridley and the drawing rink Ronnie Cairns, Mike Farrelly and skip Dave Melville. Shots Monte Mar 96 – 110 Greenlands. Points Monte Mar 5 – 9 Greenlands. 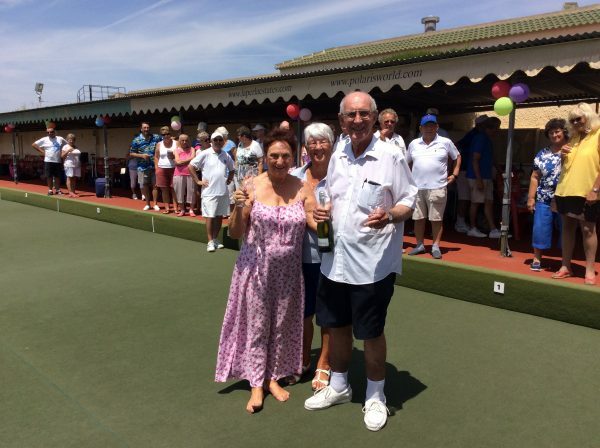 FRIDAY JUNE 16th – A remarkable result as we were winning on four rinks with three ends to go. At the end of the match the one winning rink was Denise Ashberry, June Young and skip Alan Ashberry well done. Shots Monte Mar 107 – 111 Vistabella. Points Monte Mar 2 – 12 Vistabella. 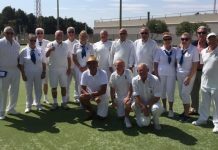 SAN LUIS BOWLS CLUB REPORT 16.06.17. 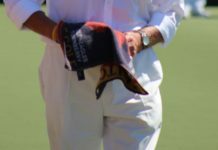 Wednesday 14th June VCLeague Falcons were home v VB Saxons; taking some useful points 8-6, shots 104-93. 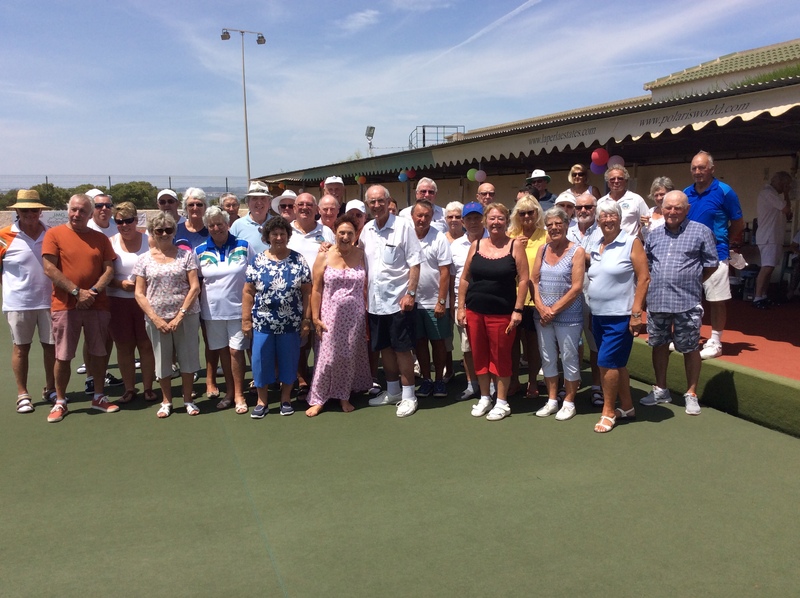 Winners: pairs; June & Keith Jones 19-10, triples; Margaret Morrison, Sabrina & Russell Marks 27-14, rinks; Bill Webb, Barry Edwards, Suzi Cooper, Roy Cordell 14-9. 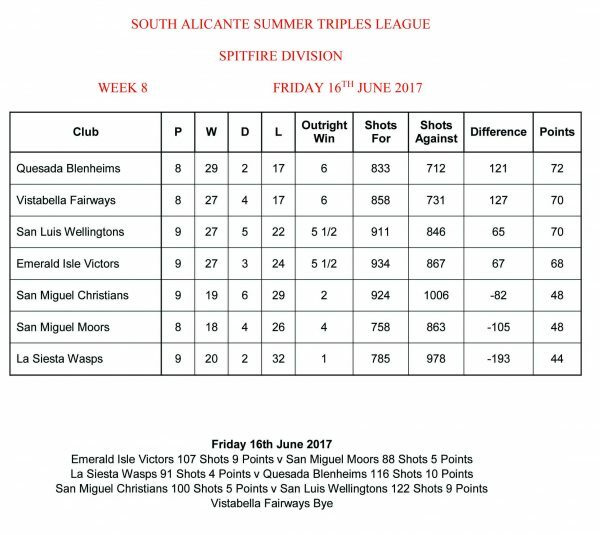 Friday 16th June, Spitfire Division: SL Wellingtons were away v SM Christians, and had a good result: shots 122-100, points 9-5. Winners: Margaret & Neil Morrison, Derrick Cooper 25-12, Bob White, Vic Slater, Keith Lowry 21-13, Colin Jackson, Bill Webb, Mal Hughes 32-12, Ann Holland, Pam Lockett, Roy Cordell 17-17. Brooks, Scott Malden 18-14, Mary Fromson, Harry Epsom, Sue Ross 21-19. “When Vic announced that we were to have the base done, a new underlay and a new carpet, as discussed and quoted for by the Greengauge representative, we all had high expectations of a great playing surface to be the “flagship” for them, of what they could provide. Unfortunately, this has not been the case as the base has shown to be “not suitable for purpose”. The Company, commissioned by the Greengauge representative, after much discussion via Julian Pering agreed to try and rectify the matter f.o.c. In order to do so the carpet and underlay had to be unstitched and lifted and then when the base was done relaid, and restitched – AT A COST – through no fault of Vic’s. Greengauge were not prepared to give in anyway at all saying the base was not within their remit, although their representative had been involved with “providing” the company. Vic has decided NOT to have any more work done on the green FOR THE TIME BEING. We have a good carpet and underlay but unfortunately the expectations of a great playing surface has not been met. BUT it is still perfectly playable and no worse than certain rinks at other clubs. 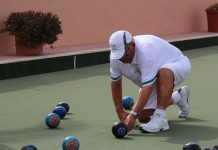 For more information: www.sanluisbowls.byethost7.com or contact June Jones, Club Captain: 691903773. San Miguel Deputies played La Siesta in the VCL winning 8 points to 6. 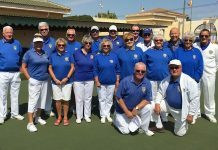 Ladies singles, Anita Brown won 21-11; Mens singles, Carl Eagle won 21-15; Pairs, Pat McEwan, Gary Raby lost 16-18; Trips, Bob Nesbitt, Dave Champion, Dave McEwan won 20-12; Rinks, Sue Milner, Paul Hayward, Ann Eagle, John Raby lost 12-18; Rinks, Ken Hope, Stan North, Eddie Cowan, Alan Campbell lost 13-20. Shots for 103 – against 94. Booth, Bob Donnelly 19-18; Stan North, Barbara Scotthern, Eddie Cowan, 25-3; David Champion, Frank Scotthern, Jack Jackson drew 19 across. Total shots were 88 for San Miguel and 107 to Emerald Isle. Club mornings are still on, though numbers are dwindling due to the heat, 0945 for 1015. The WASPS will carry on, Wednesday afternoons, 1.30pm until 12th July, and will resume on 13th September. 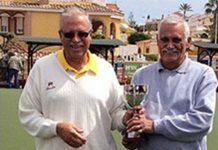 For further information on San Miguel Bowls Club, please contact the President, Rosamond Stockell, telephone 965329778 or Secretary, Pat McEwan, telephone 966714257. 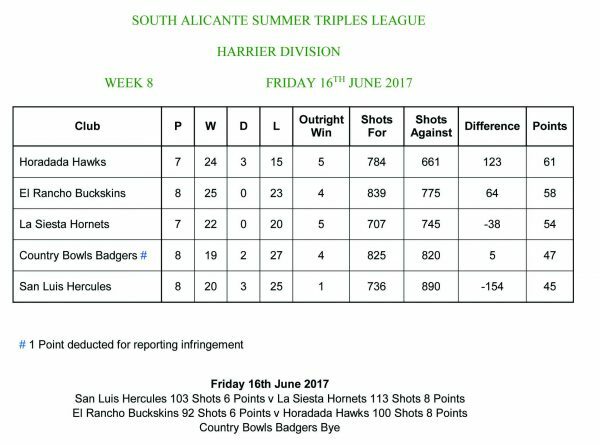 Last week we beat the VCL League Leaders and this week we upset the number two by beating San Miguel at our place 10-4. The togetherness continued for the Parsons, both Janet and Peter played the Singles and won 21-17 each. Isn’t it lovely? Captain Colin Armitage, Martin Butler and Lynne Armitage had a tight game but came out the winners 14-12. Last (Well, off the green.) but not least the rink of Barry Latham, Wendy Latham, Mike Smith and Barbara Forshaw had a good win by 18 to 13. The overall shot difference was very close, we got it by one. We might still be last in the league but we are at the moment upsetting the leaders. May it continue!!!! When I arrived to watch the Pilots I was told as we walked to the ground we were down on very rink bar one. Obviously it must have been our cheering and ribald comments that spurred the Pilots to eventually chop down the Greenland Gladiators. Good to see a lot of our friends from our old club but even better to beat them 10-4. Close all the way though but gradually La Marina took over. Mike Smith, Peter Bailey and Jean Tregoing plus Terry and Jean Perchard and Reg Jackson both pulled off creditable draws. Dave Taylor, Tom Spencer and Mo Taylor had a good win by four shots. And the Hadaways are back ……. to form both winning. Dave, Arthur Cronk and Dave O’Sullivan won 20-15 and Shirley, Steve Hindle and Carol Smith won 25-15. Two cracking results this week so well done Captains and Selectors who get a lot of stick at times. Don’t forget if you want to join our happy little Club you can phone our Captain Steve Hindle on 966184360. Don’t worry if you have never played before we can lend you all the kit you need plus some coaching. Not only is it very warm on the green but the competition is hotting up as we go into the final few games of the summer season. This week the VCL Vikings were at home playing top of the league Quesada Lions, our away leg resulted in a 6-8 win for the Lions but despite a somewhat depleted team we managed to square things up which leaves us just one shot behind them on the league table. Men’s Singles Martin Foulcer won 21-16. Ladies Singles Lynne Bishop won 21-19 and the Triples team of Jenny Chaplin, Bert Ewart & Dave Chaplin won 22-14. The shots couldn’t have been any closer VB 104 (8)- 103(6) Q. 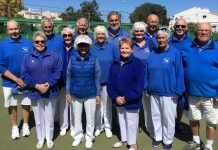 The Saxons were away to the San Luis Falcons, another hard game but well done to Ian Kenyon for yet another great win of 21-14 in the Men’s Singles and also to Lin Watkins winning 21-16 in the Ladies Singles. The Rinks team of Mike Irwin, Tony French, Geoff Paylor & Dave Jenkins won 18-4 you guys are brilliant! Shots, VB 93 (6) – 104 (8) SL. SAL League. The Spitfire league Fairways had a bye. 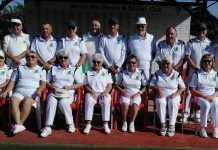 The Hurricane league Greeners travelled to Monte Mar to play the Torro’s picking up an impressive twelve points. Winning teams were Jenny Chaplin, Ken Savage & Peter Whitehall 21-7. Frank Barclay, Peter Cadwell & Barry Norris 23-15. Mike Irwin, Sue Norris & Pat Rafferty 15-10. Del Gunning, Dave Chaplin & Dave Jenkins 23-20. Rosemarie Savage, Brian Pointon, Bill Corbishly 22-21. Shots VB 111 (12) – 107 (2) MM. We have our sights set on promotion…good luck in your last game next week.